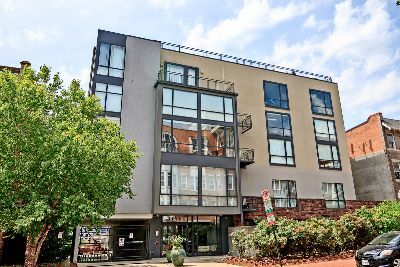 City Overlook is modern four-story condominium in Washington, DC’s super popular U Street Corridor. Located at 1454 Belmont Street NW, it is also considered to be part of the Columbia Heights neighborhood. The boutique building was delivered in 2006 with a boxy modern look further defined by grid patterns of giant windows. There’s just 18 residences including flats and lofts, with spacious floor plans ranging from 1,057 to 1,862 square feet. Models include one-bedroom, two-bedroom and two-bedroom plus den. Inside, you’ll find incredibly wide floor-to-ceiling windows—some of the units actually have glass walls that span a 40-foot width. Add maple floors, open floorplans, terraces and super-cool kitchens with long granite serving counters, mosaic backsplashes and stainless steel appliances. Luxury condos for sale at City Overlook have recently listed between around $450,000 to $1.1 million. But the reality of a smallish building in a red-hot neighborhood is that available units are scarce. Those who really crave the U Street Corridor might also been interested in buildings like 2020 Lofts and the Beauregard. There’s not a ton of common amenities in this four-story building. But it’s pet-friendly, there’s secure garage parking, an elevator, extra storage and a sweet roof deck. Plus, there’s the terrific location, right between the amazing Meridian Hill Park with its terraced waterfalls, plus exciting 14th Street with its bars and restaurants. It doesn’t stop there, either. U Street is just five blocks south with even more attractions from great dining choices to live theatre. For more information about City Overlook, call District Partners Real Estate, LLC, at 202-798-3600.